As the University of Guyana’s governing body meets today, March 30, to decide on an incremental tuition increase, students gathered outside the meeting place to protest the proposal. The governing body, which includes President of UG’s student society, Ron Glasgow, met from 1:00pm today at the university’s Education Lecture Theatre. “We want no increase,” were the sentiments of UG students, according to their chief student representative, Ron Glasgow. 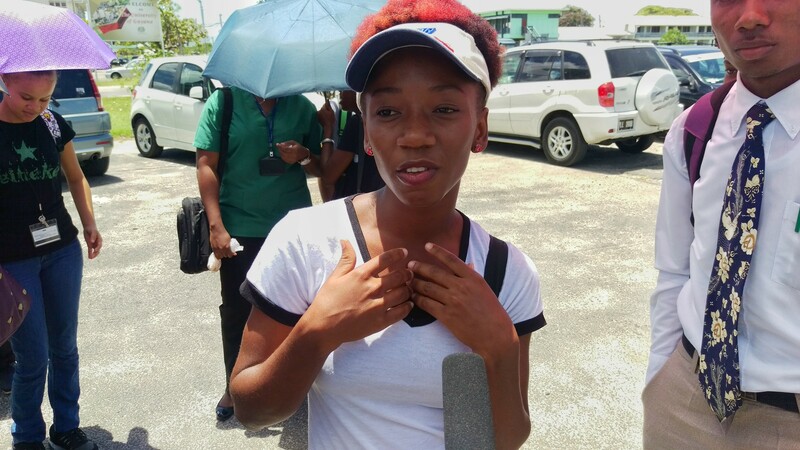 Glasgow told Demerara Waves Online News, before he rushed off to the UG Council meeting, that the increase was first announced at the beginning of the September semester last year. While the increase was proposed at 5%, a recent proposal from the university’s Vice Chancellor, Dr Ivelaw Griffith, for a 15% increase. Glasgow said he has since consulted with the student population, which is against the increase. One student, Marissa Tucker, said she is unsure how she can get money to pay for a tuition increase. She expressed concern with the situation of having to pay increased cash amounts. The Earth and Environmental Science first year student said she can handle neither a 15% increase, nor a 35% increase, which is believed to be implemented incrementally over the next couple of years. Another concerned student, Romel Roopnarine, said students must take a more proactive approach, because the increase will affect them all. Roopnarine spoke of the stories from students at a recent meeting with the Vice-Chancellor. “A lot of students sometimes would beg for passage to leave campus. They would skip lunch. But they wouldn’t want to publicly tell you about their struggle,” the student noted.